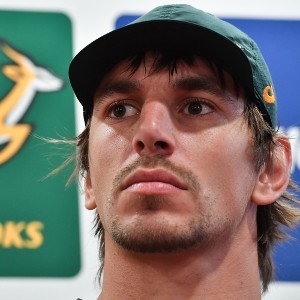 Cape Town - Springbok captain Eben Etzebeth acknowledges that his side has no excuses for their poor showing in their 38-3 loss to Ireland on Saturday. The Boks were outplayed in every department as they fell to their worst ever defeat against the Irish in a result that has increased the pressure on under-fire coach Allister Coetzee ahead of Saturday's clash against France in Paris. Speaking after the match, Etzebeth said the defeat was a difficult one to take for the Boks. "It's a tough day. It's definitely not what anyone wanted," he said. "We've got no excuses this week. We're going to have to rectify this, us and the management, on Monday and make new plans for next weekend." The skipper, standing in for the injured Warren Whiteley, added that the preparation in the build-up to Saturday's Test had been good. "It was a good week of training and then unfortunately tonight things didn't go our way," Etzebeth said. "We got into the right areas but we couldn't hold onto the ball ... we couldn't finish our chances and they finished all of theirs." Saturday's clash against France kicks off at 21:45 (SA time).